We Provide Emergency Services to Stop Issues Like This! Plumbing emergencies always seem to happen at the times where there is no one available to do the work. At All About Plumbing & Septic, you never have to worry about that because we are available 24 hours a day. We won’t charge you for after-hours services because you don’t get to choose when something goes wrong, so we don’t think you should be punished for it. When you call us at 828-778-2425, we will send a plumber out to your home or business as quickly as possible. Once we are there, we will do whatever we can to stop the immediate danger of flooding or whatever may be happening to deem it an emergency. Pipe Bursting – Pipe bursting happens when too much pressure builds up in a pipe and the water has nowhere else to go. This is usually caused by a clog of some kind. Another way this can happen is when the temperature drops below freezing and the water in your pipes becomes frozen. This can cause a pressure and buildup in your pipes that will end up bursting the pipe and causing you to need replacement. A pipe burst can cause a lot of damage and if you realize that this has happened, turn off your water as quickly as possible. 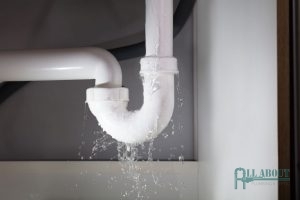 Leaks – When there is a leak, depending on where it is located, you may need to call for an emergency plumber. Large leaks can cause flooding or damage to your floor or ceiling if it is on an upper-level floor. If you see that there is water coming out from a certain area at alarming rates, it is important that you first turn off the water to the building or home if possible and then call All About Plumbing & Septic. This will allow the damage to be held off until we can get the leak repaired and see what caused it. A leak is not something you want to wait on because it will continue to pump water out and while it is doing that, it is raising your water bill and causing potential damage at the same time. Water Heater Failure – Your water heater is what creates hot water that will be used all over your home or business. When the water heater stops working, it leaves everyone without the use of a shower, to do dishes, or in some places, like hotels, it can severely impact your business. We never want you to be without hot water or have a comfortable environment. Call us right away if there are issues with your water heater and we will get it under control right away. We can even help you find a new one and install it for you if it comes down to it. Backup – This is one thing that you should never wait on if it is happening in your home. When you start to see brown or dirty liquid coming up from your drains, sinks, or even shower faucets, it is likely that it is raw sewage. When a sewage line gets blocked and has no way to let other sewage pass by, it will begin to come back up and it will do it in many different areas. This can be dangerous for your health, not to mention, gross. Give us a call right away so that we can find out where that clog is located and unclog it. When you need an emergency plumber in Mills River, Hendersonville, and Asheville, NC, call All About Plumbing & Septic at 828-778-2425. We Can Fix Plumbing Issues Fast! Overflowing Toilet – One of the worst feelings is when you flush a toilet and it starts to come back up. You may not know what to do in this situation, but calling us would be a good start. This means you have a clog somewhere so you will want to grab some towels and a plunger and get to plunging. This may actually clear up the clog before you ever need to call us. This kind of emergency is extremely common, but not panicking and trying the plunger trick first, may avoid any further damage. Our plumbers always give you upfront pricing so that you know what you are paying for with no hidden costs. Every single one of the plumbers on our team are fully trained, certified, and are able to communicate clearly with you about what is going on with your plumbing so that you are getting exactly what you want and are always satisfied at the end of a service call. Our dependability and quality are what we strive to bring you every single day because we never want you to hesitate to call us when you have something go wrong with your plumbing system. We see people in need of an emergency plumber all of the time because leaks happen or toilets overflow when you least expect them to. The good news is that there is nothing that we cannot handle so when you need an emergency plumber in Mills River, Hendersonville, and Asheville, NC, make sure you call All About Plumbing & Septic at 828-778-2425 for immediate help. Updated on January 22, 2019 at 12:44 pm by All About Plumbing.